Last month I went to the new Knitting Factory in Brooklyn to see the Raincoats and former Slits member Viv Albertine — two legends of late ‘70s British punk rock music. At the time they were the only two acts I wanted to see. Sandwiched between them was an unknown band (as far I knew) called Soft Power. I had absolutely no idea who this group was prior to their performance when I retreated back to the rear of the venue after Albertine’s set. However, during Soft Power’s stint, I was really impressed by the music. It was angular-sounding alt-rock music but accessible (in a good way) that it kept my interest throughout their set. When I got home afterwards, I wanted to know more about Soft Power so I went on Google and discovered their MySpace site. One of the members of the group is singer Mary Timony, whom I first heard of through her 2002 solo album The Golden Dove on Matador Records. 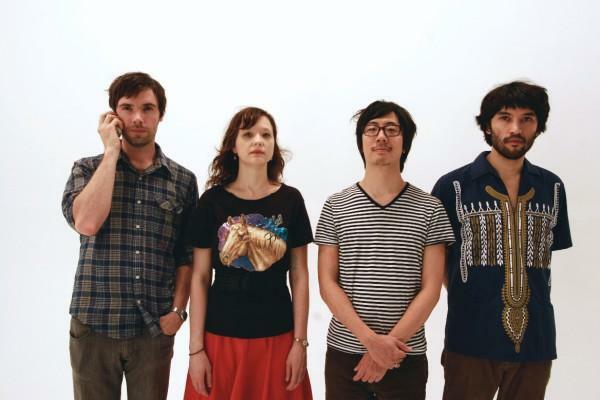 As most alt-rock fans know, Timony is best known for her time the groups Autoclave and Helium as well as her a solo career with four albums under her name. The Washington-DC based Soft Power (originally called Pow Wow) are a relatively new group featuring Timony, Jonah Takagi, Winston H. Yu and T. J. Lipple. Currently they are working on their new album. (Two songs “Izabella” and “La La La” can be heard on their MySpace site). Having played already in New York and other cities, the group is coming back to Brooklyn to perform at Southpaw this Saturday night. To learn more about Soft Power, NewBeats had a chance to talk to Mary Timony and Jonah Takagi to talk about their band, how they got started and their music. 1. The most obvious question is how did the band form or how did the band members know each other? It seems pretty recent. Mary: We have all been friends for a while here in D.C., and it just seemed natural to start playing music together. 2. Mary, you’ve been in other bands, including Helium, and of course you’ve worked as a solo artist. How would you compare the music of and the working relationship within Soft Power to your previous musical projects? Is it similar and/or different, and if so how? Mary: From my perspective, I was getting a little bit burnt out on doing solo records, and being the front person, and really felt like being involved in a more collaborative project. Soft Power is really fun because it is very collaborative. 3. You guys were originally called Pow Wow but changed it to Soft Power? How did you arrive at that name? Mary: Well, we heard there was another band from NYC called Pow Wow, so we decided to change it. Jonah came up with Soft Power. Jonah: There was also a French a capella group that was named Pow Wow. 4. Jonah, could you tell me a little bit about yourself since this is the first time I’ve heard of you through Soft Power? How did you get involved in music? Jonah: I’ve been playing other people’s music for a while mostly backing up friends. When I met Mary and we started playing together, she encouraged me to start writing. It’s been interesting, I haven’t quite figured out an approach that works consistently. Right now I’m into throwing a bunch of stuff at the wall to see what sticks. 5. This is more of a comment than a question, and perhaps you can elaborate or tell me if I am completely off the mark, but my impression of Soft Power’s music is that it’s angular, guitar-centric, heavy and yet melodic. Is that a fair description? Mary: I think so, also a lot of the songs we are now recording sound pretty different from each other I think, but that seems like a good description of the songs that are up on MySpace. Jonah: I agree, sometimes I feel like we are incredibly schizophrenic sounding. 6. I like the two songs I heard on the MySpace site, including “Izabella.” Can you tell me the story behind that tune? Mary: That song came from a guitar part I had recorded about 10 years ago on a crappy little digital recorder from RadioShack. It ran out of batteries, and I threw the recorder in a drawer, and forgot about it. Then last year I was cleaning out the drawer, and found the tape recorder, and changed the batteries. I heard the guitar part, and decided it would be a good song for Soft Power. 7. Again this is more of a comment but I like the instrumental interplay between you guys. Can you describe the music-making process in the band—who writes the music and the lyrics? Where do you draw your inspiration as far as lyrics go? Jonah: Usually, Mary or I will demo something at home and then bring it to practice. Things get re-worked, sometimes over-worked and sometimes un-worked until it sounds like music. It’s pretty collaborative with the best songs coming from the clearest vision. 8. If I read correctly, you are working on a new album? If so, how is that progressing and when do you anticipate it being released? And are you signed to a label or do you plan on putting out this record yourselves? Mary: We are indeed working on a new record. We are just finishing overdubs now, actually. We are not entirely sure what the plan is yet, but we hope to have it out by this spring/summer. 9. You guys have toured recently—what has been the highlight(s) so far—something exciting, fun or weird? Mary: Jonah has good stories, he can answer this one. Jonah: We’ve only played a handful of shows and to be honest, there is not much to report. Besides the entertaining banter, two things that come to mind. The power went out at the last show we played and I try to get people to stop at Tony Luke’s in Philly whenever we go to NY, it worked once. 10. Mary this question is particularly for you and I wouldn’t be surprised if you get asked this a lot: I had no idea that you were referenced in the Death Cab for Cutie song “Your Bruise.” Do you know the guys from Death Cab, why did they name you in the song, and what was your initial reaction at the time when you first heard it? Mary: I don’t think I have ever met the guys from Death Cab, actually, and I don’t know the story behind that reference in the song. I have heard it, because my friend Brendan Canty is working on a movie about Death Cab, and he played the song for me. 11. For you guys, how is it like performing in NYC? Is it a different vibe playing there compared to D.C.? Jonah: NYC is great. It seems like you can never play enough up there, as long as you submit to it’s mercy. Anything goes, getting lost in Bushwick, getting your car towed, bed bugs, finding a bathroom, weird backlines… D.C. is great, really supportive community, but you have to be careful. D.C. is a small town. No matter how good a show you put on, if you’re playing all the time it will get hard to bring people out. 12. What are your thoughts of the music scene today (I know that’s a very broad general question), especially in alternative rock? Are there any current or new bands that you listen to and like a lot? Mary: Two bands that I have heard lately that I like a lot are the Icy Demons, and Talk Normal. Jonah: I danced hard in a cabin in the woods listening to MGMT. I don’t know what they are up to these days, but the Ex Models are pretty awesome. 13. So what’s next for Soft Power after this upcoming show in Brooklyn? More recording and/or touring? Just going to power through finishing recording, and mixing, and mastering, and get this sucker out! !